Earlier this week, I wrote about advertising for the “Howard Stern brand”. As a follow up, I want to share a some thoughts on the importance of being patient with brand-building ad campaigns. This never made sense to me. It always seemed that my clients were never patient enough to wait for a campaign to start making an impact before they were on to the next best thing. There are probably lots of good reasons why smart clients would quickly abandon their ad campaigns. Turnover was always a big reason. I was an account guy on a large consumer packaged goods brand, and over the course of three years I saw three different brand managers come through. So, basically, a brand manager would come in, try to make an immediate impact by changing the campaign and then on to the next assignment. Up the ladder. But there’s a real problem with constantly changing your ad campaign. The brand ends up getting dilluted, reducing the potential impact you can have with your target audience. In this age of media overload, consumers are exposed to more than 3 million ads every day. It’s as if we are surrounded by a virtual Times Square every minute of every day. How can any brand expect to break through the clutter if they’re constantly changing their message? When I left the agency world to venture to the dark side—I mean the client side—I told myself, I wasn’t going to be one of those clients developing new campaigns every few months. I was going to develop a good campaign and stick with it. 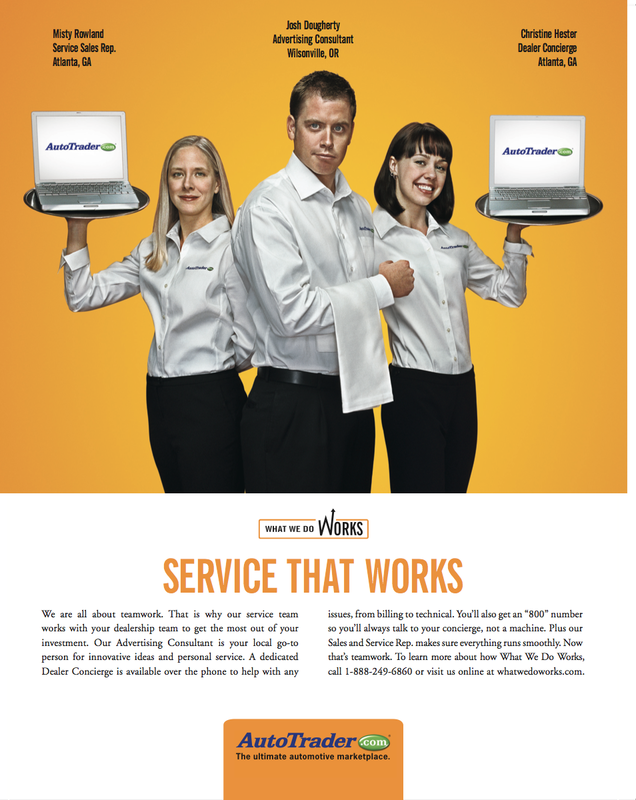 When I joined AutoTrader.com in 2007, we were in need of a new b2b ad campaign. We did a lot of research, came up with a strong strategy and executed what we believed was an effective campaign. When we launched, I was excited to start tracking the results. I expected to see an immediate impact. But, honestly, nothing really happened. Our business didn’t pick up. All of our key performance metrics stayed flat. When the ads were tested in publications, they did OK but not great. I wanted them to be No. 1, but they were only in the top 10. It was very frustrating. I started thinking that we needed to change the campaign. Then I remembered the lessons from my agency days. I didn’t want to be one of those clients who questioned the rigor and judgment that had gone into the development of the campaign. So I decided to show a little patience and give the campaign time to grow. We did another round of ads, evolving the campaign but sticking with the overall direction. The next year, we started to see our ads begin to gain some traction. In ad testing, we went from top 10 to top five. For our online ads, the click-through rate improved. It seemed that our patience was starting to pay off. After the second year we decided that we would again continue with the campaign for another year. At this point, I was a bit bored with it, but it seemed to be working so I didn’t want to change course quite yet. Maybe just one more year. The next year, the campaign continued to evolve and we saw even better results. In three consecutive tests, our ads scored No. 1. The research company couldn’t give me a good explanation why our ads performed better in year three than year one, but I think I know why. We showed some patience. Rather than throwing out the baby with the bathwater, we continued to fine-tune the campaign. To evolve it and get it right. You just can’t underestimate the impact of consistency. After several years of people seeing our ads, it seemed that they really started to resonate. We’re now in year four of the campaign and it continues to perform well. You can see some sample ads below. We’re actually talking about a new campaign direction for next year. Nothing would make me happier. I think four years is a great run for any ad campaign. After all, the fun of advertising is developing new ideas. But I’m glad we were patient with our current campaign and gave it time to grow. So, when you get that immediate urge to change your ad campaign, maybe just show a little bit of patience. The results might surprise you. Originally published in BtoBonline.com on November 23, 2011. Thanks for the link! Steve Jobs was obsessed with the Apple brand. The famous story is that Jobs rejected the boxes for the iMac because they weren’t the pure “Apple white”.